HayMax uses organic beeswax from the rain forest in Zambia. HayMax PureTM contains no essential oils. Its perfect for those who dont like the smell of Lavender or Frankincense, or who are particularly sensitive. We were asked for a version of HayMax with no added fragrance by many people last year, so here it is! 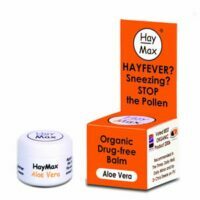 HayMax is the actual product which won the BEST PRODUCT ORGANIC at the Natural Trade Show 2006 in Brighton. It is made from beeswax, essential oil and vegetable, corn or sunflower oil.